JUNEAU — As the new administration of Gov. Mike Dunleavy prepares its first budget, the governor is taking a firmer hold on state finances. In an administrative order dated Wednesday, Dunleavy has assigned the administrative services directors of every state agency to the Office of Management and Budget rather than their parent agency. The idea isn’t entirely new: It had been floated but never pursued under the administration of Gov. Bill Walker. The order, while dealing with the sometimes-arcane process of state budgeting, is expected to make it easier for Gov. Dunleavy to direct funding toward or away from particular areas. The order was not published by the administration but was shared Thursday night with the Daily News by a state employee. Previously, the state’s budget process has worked from the bottom up: Divisions share their budget needs with their department, and departments pass their needs to OMB, which is part of the governor’s office. With the change, departments' budget directors are answerable to OMB — and in turn, the governor — rather than their commissioners. “It’s more of a partnership process rather than just being bottom up,” said Donna Arduin, the new director of the Office of Management and Budget. Explaining the order in her office, Arduin said one of her goals is to bring policy and budgeting closer together. “They should go hand in hand, and that’s the way we’re designing this office,” she said. Arduin is known as a budget fixer for state governments nationwide and has worked in places as varied as Michigan, New York, Illinois, Florida and California. When she arrived in Alaska, she found the Office of Management and Budget was much smaller, and with a narrower scope, than she had experienced elsewhere. For example, she said, in Michigan, that state’s equivalent combines the functions of Alaska’s Department of Administration, the Office of Management and Budget, and portions of the Department of Revenue. “I think Gov. 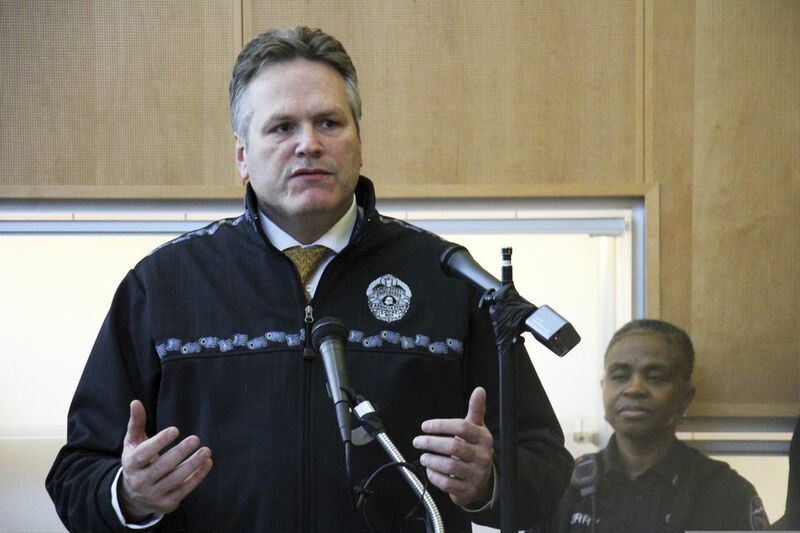 Dunleavy is wise to do it early in the administration,” said Sheldon Fisher, who served as commissioner of revenue and commissioner of administration. Fisher had floated a similar concept but didn’t pursue it to completion, he and other former Walker administration officials said. By phone, Fisher said Dunleavy is smart to take action early, since administrations can fall into a “pattern” once in place for a while. The new structure may make budget-cutting easier for the governor. There has traditionally been resistance to executive-driven budget cuts from department administrators who are tasked with delivering the same level of service, but with less money to do so. “Certainly, there’s a certain tension between the goal of a governor’s office to streamline government and the interest of a department to deliver services,” Fisher said. Arduin said shifting staff will help in the drafting process. “Right now, we need all hands on deck to work on the budget,” she said. Laura Cramer, formerly a budget expert in the office of Sen. Anna MacKinnon, R-Anchorage, is the new deputy director of OMB. She offered an example of a way the administrative order will help: Public safety. Drug treatment programs might be funded through the Department of Health and Social Services, pretrial monitoring through the Department of Corrections, and other aspects through the Department of Public Safety itself. More tightly linking budgets and policy could make coordination easier and allow the governor to better direct the state’s efforts. It will also make the process of budgeting more efficient, Arduin and Cramer said. That may lead to layoffs, as fewer staff would be needed for budgeting. James Brooks covers state government, the Alaska Legislature and general assignments for the Daily News. He previously reported and edited for the Juneau Empire, Kodiak Daily Mirror and Fairbanks Daily News-Miner.